Search Results for "picking apples"
Apple picker dumps his apple basket of just picked apples into the apple crate in an orchard. 1950s: Girl picks apple from tree. 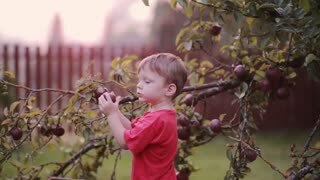 Boy with cap picks apples from higher up in tree. Girl bends and places apple down. Low altitude aerial of a farmer and farmhands picking apples. camera goes over tractor and reveals the men picking apples. Aerial descending of apple picking by immigrant farmhands with a tractor nearby with an apple crate with freshly picked apples in it. Apple picker in tree furiously picking apples with a large apple crate setting in an apple orchard. 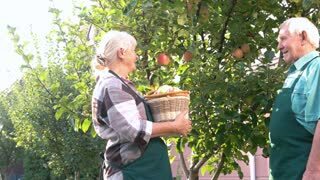 Apple picker furiously picks apples from a tree in an orchard with an apple bin nearby. Steadicam gimbal movie around an immigrant farmer picking dumping apple into a bin and picking apples in an orchard. Apple picker deep in a tree picking apples with the sun glinting through the branches. Apple picker up on a ladder in an apple tree picking apples and putting them into his hip basket. Apple picker picking apples and putting them into his hip basket. Immigrant apple picker carries ladder in apple orchard, rests it against a tree and climbs it and begins picking apples as camera orbits around him. Apple bin with tractor moving and immigrant fruit pickers bringing a basket full of freshly picked apples. Farmer gets out of tractor with apple bin on the front and reveals immigrant apple pickers picking ripe apples from the trees on a sunny day. Circular orbit of apple bin with harvested apples on front of tractor in a apple orchard while a farmer picked apples. Aerial tracking a farmer in an apple orchard carrying a filled apple basket where he takes it to the tractor and unloads it into an apple crate. Other farmhands pick apples and corn field is outside the orchard. 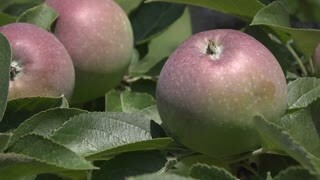 Immigrant farm hand picking apples on a ladder in a tree and camera angles up to reveal more pickers. Immigrant fruit pickers picking apples in an orchard on a sunny day. Immigrant fruit pickers picking apples in an orchard with a beautiful blue sky. 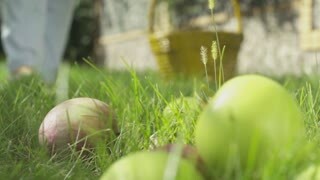 Wide angle shot of immigrant farm hand picking apples in an orchard and then the camera pushing in to an apple bin. Steadicam gimbal moving through an apple orchard as immigrant fruit pickers pick apples.